The Arduino web server hosts a web page that displays four analog input values and the state of three switches. The web page allows four LEDs to be controlled – two LEDs are controlled using checkboxes and two LEDs are controlled using buttons. When more than one computer (web browser) is connected to the Arduino web server, then outputs (LEDs) switched on using one computer will be updated on the other computer – i.e. when a checkbox is clicked to switch an LED on from one computer, the checkbox will also be checked on the other computer automatically. The following video shows two computers connected to the Arduino web server and as changes are made on the web page on one computer, they are updated on the other. In the video, A3 was connected to a voltage divider, A4 was connected through a resistor to GND and A5 was connected through a resistor to +5V – not shown in the circuit diagram. The Arduino will respond to every Ajax request by sending an XML file back to the web browser. The XML file contains the values from the four analog inputs of the Arduino (A2 to A5), the state of three pins (switches on pins 2, 3 and 5) and the state of the four LEDs. The source code for both the Arduino sketch and web page are a bit big to include on this page. It is suggested to download these files below and open them in your favourite editor when following the explanation below. To run this example, first copy the web page (index.htm) from the above download to a micro SD card. Insert the micro SD card in the card slot of the Ethernet shield. The Ethernet shield must be plugged into an Arduino board, connected to your network and powered by USB or an external power supply. Build as much of the circuit as you want. If you don't connect anything to the input pins, they may just toggle randomly as they pick up noise. Inputs can always be pulled high or low through a resistor if you do not want to connect them to switches or a potentiometer. 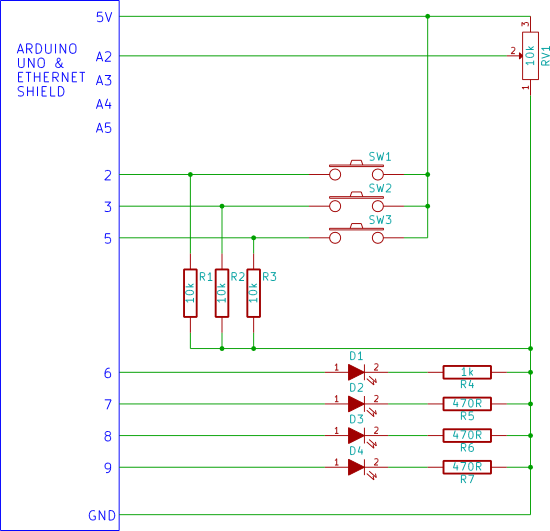 Load the Arduino sketch (eth_websrv_SD_Ajax_in_out) from the above download to the Arduino. Surf to the IP address set in the sketch using a web browser – you should see the web page loaded and the analog values and switch values updated every second. The Arduino sketch and web page are basically modified versions of code from previous examples in this multi-part tutorial. The files are modified versions from the examples that use Ajax with XML (part 14 and part 15). The analog inputs (analog values) and digital inputs (switch states) are requested and received the same ways as explained in part 14 of this tutorial, except that the analog values are all enclosed in <analog> tags and the switch states are all enclosed in <switch> tags – i.e. they do not use unique tag names for each input. The first line of the above code gets the number of items in the XML file that are enclosed in <analog> tags and stores it in the variable num_an which is then be used in the for loop to get the correct number of analog values. The switch values work the same way, but each HTML span with the class name switches has a value from the XML file with the tag switch inserted into it in the order that they appear. The Arduino keeps track of which LEDs are on and which LEDs are off. This information is sent back as part of the XML file in response to the Ajax request that occurs every second. This array is initialized with zeros – all LEDs off. Each element of the array corresponds to an LED in order from LED1 to LED4, i.e. LED_state stores the state of LED 1, LED_state stores the state of LED 2, etc. Otherwise the checkbox is unchecked. This ensures that every browser that connects to the Arduino web server displays the correct states of the LEDs because they are receiving the LED states every second. When a user checks or unchecks a checkbox, then the next Ajax request will include the LED name and state with the next HTTP GET request. All the other LED strings will be empty if a checkbox or button has not been clicked, so will not be included with the GET request. When the Arduino receives the Ajax GET request, the SetLEDs() function in the Arduino sketch checks for a change of LED state in the received GET request and if it finds one will switch the corresponding LED on or off and then save the state of the LED to the LED_state array. The text on the buttons is updated to show the state of the LEDs that they control. Storing the button state is necessary so that when the button is clicked again, it knows whether to update the string that is sent with the GET request to switch the LED on or off. 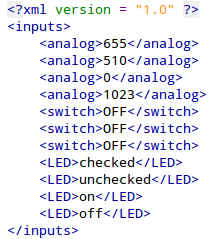 When the Arduino sends the state of the LEDs in the XML file that are controlled by the buttons, it inserts "on" or "off" between the <LED> tags instead of "checked" or "unchecked" as it does for the checkboxes. The CSS used in this example puts each set of inputs or outputs in their own boxes with a blue border. It also positions the boxes next to each other. If the browser windows is resized along its width, then the boxes on the right will move below the boxes on the left. The CSS in this part of the tutorial will not be explained here, but will be explained in the next parts of this tutorial where we look at more CSS.